James Tanton (PhD. 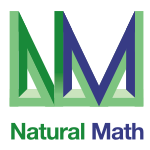 Mathematics, Princeton University, 1994) is a research mathematician deeply interested in bridging the gap between the mathematics experienced by school students and the creative mathematics practiced and explored by mathematicians. 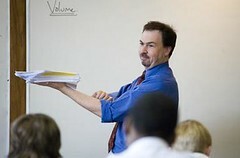 He is now a full-time high school teacher and does all that he can to bring joy into mathematics learning and teaching. James writes math books. He gives math talks and conducts math workshops. He teaches students and he teaches teachers. He publishes articles and papers, creating and doing new math. And he shares the mathematical experience with students of all ages, helping them publish research papers too! A page from "Math Without Words" - a book of puzzles. See also Sue VanHattum's review of the book.